Recognized as the best ligament knee brace available. Top-of-line protection that is custom fit for your leg. Ideal for athletes looking to prevent a knee ligament injury or re-injury to surgically repaired ligaments. The #1 custom-made knee brace in the world! The DonJoy Defiance III knee brace is the most popular custom knee brace in the world. In fact, the Defiance III is worn by many professional athletes including members of the US Ski Team, Shawne Merriman of the San Diego Chargers, and World Champion Big Wave Surfer Garrett McNamara. The Defiance III is the strongest knee brace offered by DonJoy and is recommended for athletes participating in high collision sports, like football, motorcross, or skiing. This brace is ideal for athletes who participate in water sports like surfing, wakeboarding, or kite surfing. People recovering from ACL and other knee ligament surgeries also use this brace on regular basis. Why do I need a custom knee brace? Wearing a custom knee brace means maximum support is applied where you need it most. When you order a DonJoy Defiance III knee brace, one of the DonJoy bracing experts will come to your house or office to take your measurements. Then DonJoy will custom manufacture a brace that fits your exact measurements. This perfect fit ensures the components of the brace align perfectly with your body ensuring maximum protection and comfort during movement. By wearing a brace that is custom manufactured for your knee, you can play your sport with confidence because you know that you're less likely to re-injure your knee. The brace is manufactured to your exact measurements, which means the components of the brace align perfectly with your body ensuring maximum protection and comfort during movement. The DonJoy Defiance is available in 3 lengths: standard, short, and a short calf version for ski boot clearance. This patented technology was developed to reduce the strain on the ACL by distributing the load placed on the ligament via four points. Click here to learn exactly how the Four-Points of Leverage works. Makes you less likely to suffer from an ACL injury because it reduces the amount of time your knee is in an "at risk position", enhances the Four-Points of Leverage by increasing the posterior load applied by the brace on the tibia, and improves your natural gait by applying progressive resistance before reaching a firm end point during movement. This brace is both unbelievably strong and lightweight. You get the protection you need without feeling like you're being weighed down by your brace. Your knee brace will stay in place no matter how active you are. These tabs enable the brace to move with you. This knee brace comes with a lifetime warranty on the frame and hinges, and a 6 month warranty on the soft goods. When you order a DonJoy Defiance III knee brace, it will be custom fitted by one of the DonJoy bracing experts. Upon placing your order, we will contact you to schedule an appointment with a representative to take your measurements. Your brace will be delivered approximately three weeks from the date your measurements are taken. Instructions for Use...how to put on your DonJoy Defiance III knee brace. To ensure you are properly applying your brace, click on the Video tab above and watch our Fitting Video. I am an offensive tackle who has <a href="http://www.betterbraces.com/injury-info-center/knee-injury-guide/osgood-schlatter-disease">Osgood Schlatter</a>. Will this brace reduce the pain and prevent further injury? For Osgood Schlatter you would find the most comfort with a buttress around the lower portion of your knee. A brace such as the DonJoy Performer Patella Knee support would be a good option. Other options for you include the Reaction WEB knee brace or the DonJoy Cross Strap. What is the best brace for a women's soccer player when is returning from Acl surgery? The best brace for a female soccer player returning to play from an ACL injury would be one of 2 braces. The Defiance, or the FullFource/FemaleFource. Both come with a short calf option (Great for shin guard accommodation) and the FourcePoint hinge, which gives extra protection to the ACL. The protection level is the same. The difference is the Defiance line is custom fit, and has a life time warranty on the frame and hinges. Also, The Defiance line is a carbon fiber material. The FullFource/FemaleFource is aircraft grade aluminum and has a 1 year warranty on the frame and hinges. My patella ligament dislocates. This brace looks great, but is there something that would be able to secure my patella? The Defiance III brace can have a tru-pull attachment add on to allow for patellar stability. Would this be a good choice for tennis or would the Full Force be a better option for non contact sports? Both braces would work for playing tennis. The differences are that the Custom is made of a carbon composite has a lifetime warranty on the hinges and frame and is made specifically for your leg for the best fit. The full force is made of aluminum has a one year warranty on the frame and hinges and is patient ready so you only need three measurements and look for you size in a sizing chart. I have had an ACL reconstruction surgery after It was fully torn, and I seem to have re-injured the same knee a year later with a minor tear. I practice Parkour and variations of Gymnastics, that typically involve myself landing prominently and only on my injured knee (Hard and forceful landings). I do not want to sacrifice speed/power/flexibility or anything that hinders my movement as much as possible, but I still want full protection for my torn ACL. So, my question is, which Knee brace should I order? A Donjoy Defiance or a Donjoy Fullforce? Thank you for your question. The 2 major differences between the FullFource and the Defiance line are going to be 1. The materials and 2. The warranties. The FullFource is made of aircraft grade aluminum and the Defiance is a carbon fiber. The warranty on the FullFource frame and hinges is 1 year and the Defiance has a lifetime warrant on the frame and hinges. Both braces will be light weight weighing about 22 ounces, allow full range of motion and protection to the ACL. The Defiance allows for more variation in color and styles as well as a custom fit. Would you recommend this brace to someone who is an avid basketball player who has never had any ligament surgery (or injury) before, but who is looking to protect his knee ligaments in general? I have a partially torn ACLU, which my doctor cleaned up, but said he didn't need to replace as he could not make it fail during surgery. However, I did have a lateral meniscus transplant, ACI and distal femur osteotomy in the same knee last month. My doctor said I may want to go with the Defiance OA in order to keep the lateral side "jacked open" during sports. I don't see the defiance OA on this site though and wondering how to order. Thanks. Also, do you agree this is the best brace? This will be an excellent brace for you ACL and meniscus problems. You would order the DonJoy Defiance brace. When the rep contacts you, you would let them know it is going to be an OA brace. Hi, I partially tore my ACL in my left knee in September. In October I had acl reconstruction. I'm hoping to be back to playing soccer in the late spring but I want to have a knee brace for support and more peace of mind. what do you suggest is the best? I really don’t want to tear it again. The Defiance Brace is the best knee brace for you to wear after a ACL recontruction to protect the knee. It is custom made for your leg only and it has the combined technology of our 4 Points of Leverage Strapping and the fourcepoint hinge which both have been clinically proven to reduce ACL tears up to 50%. If you are interested in getting this brace you can get in contact with your local DJO rep, either through your doctors office of you can contact product support at (888) 405-3251 and we would be happy to get that information for you. How does the defiance for OA, compare to the other custom OA braces. I am a police officer, and need a reliable brace, that can with stand the riggers of my job. The Defiance OA brace is our best OA brace. It is measured specifically for your leg only to maximize the best fit. It also can accommodate up to 10 degrees of correction where our off the shelf braces will only accommodate 3-7 degrees. The frame is made of a strong carbon composite that is lightweight and durable. This is the same frame that we use for pro football players braces. The defiance brace is designed primarily for ligament instabilities. This would be a great brace for your ACL injury. If the cartilage damage is on one side more than the other, you may want to look at a brace from the DonJoy OA line. The OA braces are designed for Osteoarthritis and meniscus injuries and can be combines with ligament strapping for the ACL. My son just tore his ACL and MCL playing High School Football. He is an Offensive Lineman and weighs 240 lbs. Would the Defiance Custom Brace provide the best protection available for an Offensive Lineman? The Defiance III would be an excellent choice for your son. This brace comes standard with the swooping thigh and swiveling tabs, which are great for athletes. It would be recommended that you also go with the metal power caps and reinforced fiber frame since your son plays a contact sport. If you would like to have your son measured, you can give us a call to get the name and number for your local rep. I'm participating in muay thai boxing. I had acl surgery. Is this a good brace for me when I start full training again? I also live in Vietnam and my uncle lives in the US. How can I get this brace? The Defiance III custom knee brace is our best brace for return to high activity after ACL reconstruction. If you wanted to get this brace you would need to be measured by either a medical professional or a DJO representative. We do have other options that would only require a few measurement that you could do on your own and your Uncle could order the brace for you in the US. Take a look at the Armor https://www.betterbraces.com.au/donjoy-armor-knee-brace-with-fourcepoint-hinge or the Full Force https://www.betterbraces.com.au/donjoy-fullforce-ligament-knee-brace. Both of these braces are used for contact sports and have the same Four-Points of Leverage and FourcePoint hinge technology that reduce re-injury of the ACL by 50%, that the Defiance III does. You would only need to measure 6 inches above your kneecap, 6 inches below the mid knee and at the knee joint and find the size that corresponds to those measurements. I'm a offensive lineman a sophomore who was on varsity i dislocated my patella 5 times and I'm getting MPFL reconstructive surgery is this brace a good option for me? The Defiance Knee Brace is our custom brace used primarily for prevention of ligament injuries and post ligament injuries. This is a good brace for you in that preventative aspect. I recommend you add the tru-pull attachment to this brace to support the patella. Both the Armor and the Fullforce (as well as our defiance III) come with ForcePoint hinge which I would recommend you get. It's an added ACL protection option. The armor is the strongest brace we make at .125" thick. I would first consider that brace over the FullForce for you. We recommend this brace for contact sports (and snowboarding can be as much a contact sport as some other traditional sports). Both the FullForce and the Armor come in a short option; depending on how tall you are and how high your boots come up you may think about going short. a standard brace will be 18" in length and the short will be 17" bringing it up on the calf an inch higher. My name is Yacine and I'm a football player in Sweden. I play as an offensive lineman and I'm currently looking for two braces, one for each leg. I've torn my <a href="http://www.betterbraces.com/injury-info-center/knee-injury-guide/torn-pcl">PCL ligament</a> in my right knee and I'm suffering from overloading in my left knee. Therefore, I'm currently looking for two knee braces. One brace that will help my right knee with the PCL rupture and one that will help my left knee from getting overloaded and risking to tear something off. The Defiance III would fit you the best it is custom made to your leg's specifications, these are the same braces NFL Lineman wear to protect their knees. 6 weeks ago I had an operation to reconstruct and reattach pretty much my entire PosteroLateral Corner of my knee as well as my ACL. The Surgery was successful. Doctor has however said that it will be difficult for me to Play Soccer/Football again due to the Pivoting? (I know this would only be in over a years time). He said mainly due to the fact that the PosteroLateral Corner was very badly damaged. Does the Donjoy Defiance III Custom Knee Brace protect the PosteroLateral Corner of the knee and will it allow me to play my sports again? Or is there a better knee brace for this injury? The Defiance Knee Brace is a Custom ACL Brace. We also have Off the Shelf ACL Braces, the Armor, and Full-Fource, all feature the FourcePoint hinge which prevent the knee to go into hyperextension. I'm looking for a good ACL brace (for my partially torn reconstructed ACL) that would last playing beach volleyball without the sand ruining the hinges. This one looks like it has a slightly different hinge than my current Dongjoy Knee Brace (Donjoy Armour) - will this brace, or another Donjoy brace work well in the sand without getting ruined? Another one I checked out was the Defiance III Female Fource. Anyone of our braces can be used for beach volleyball. I recommend rinsing the brace out with water after use, to make sure all sand is removed from the hinge. I recommend the Armor, due to the diving/hitting the ground, this brace frame is more rigid and will hold up. I am an 'at risk female' with an ACL reconstruction on both my left and right knees. I play Ultimate Frisbee and need to be able to cut, sprint, jump, change direction, dive ...etc. Can you wear a brace on both knees and still move freely? Yes, I recommend wearing a ACL Knee Brace to protect your recent ACL reconstruction. You have the option of our Custom Defiance or our off the shelf knee brace Armor. I have an old Townsend custom brace but it made my knee sore after use as I wasn't able to bend my knee all the way while playing sports due to the straps not being able to flex due to flexing of my calf . Is the Defiance III designed for full range of motion for the knee? Yes, all our off the shelf bracing and Defiance Custom Brace allows for Full Range of Motion. If you would like to limit the range you have the brace is adjustable by inserting flexion stops into the hinge. I have a fully torn PCL and strained LCL. I am a professional martial artist and need to get back to kicking and brazilian jiujitsu. Which brace supports the PCL best for a high impact and twisting? i have a completely torn (grade 3) ACL and horns of both menisci in my left knee. i have not yet got the injury operated upon but i would like to continue playing basketball. kindly recommend the best knee brace from your products which would fit the needs of this contact sport especially with the jumping and landing and quick shifts in posture without compromising with speed and stability. The Armour is for Contact Sports; football, soccer , rugby. The Fullfource I recommend for basketball, volleyball, tennis. I have my ACL totally torn and my MCL partially torn and no plans to have them operated for the next year. I’ve been doing physiotherapy regularly and I need a brace that support my landings (I’m a skydiver and I need to run some steeps in my landings). Which brace is more recommended for my case? Thank you very much. The DonJoy Defiance Custom Brace with Fourcepoint hinge and ACL strapping sequence would be highly recommended for your activity and injury. I am looking for the best knee brace you have that can be used for skiing and other sports. I have had two ACL reconstructive surgeries on my right knee in '91 and '06. Can you provide both a custom model and off the shelf model? Yes, The Defiance III with FourcePoint hinge, for off the shelf, the Armor with FourcePoint hinge and a short calf. You were emailed a printed copy of instructions on how to put the brace on. How long does it take to get a brace resized? Normally the turn around time is 24-48 hours. Once you work with your sales rep or health care provider in getting the appropriate measurements, it will be submitted and made either the day of or the following day (depending on what time of day the request is made). It is then shipped out to you once it has been made. Will the straps still grab as tight after being in and out of the lake all summer long? The straps should not be affected as the grip is made of hook velcro. However, if a brace is worn in water (pool, lake, ocean, etc), we recommend that after use, it be rinsed under tap water to remove any debris, salt, chlorine so as not to compromise the integrity of the straps and brace. A custom knee brace is a big financial investment, can you tell me how many years the brace is expected to last? Our custom braces are built to have an indefinite shelf life. We have a life-long guarantee on the hinge and frame and a 6 month guarantee on the soft goods (straps, pads). It's an extremely durable brace - many professional athletes use them in collision sports such as football. I tore my meniscus during pre season football and there was a servere risk of my ACL being torn. Fortunately, it wasn't and I had a bucket handle torn meniscus. 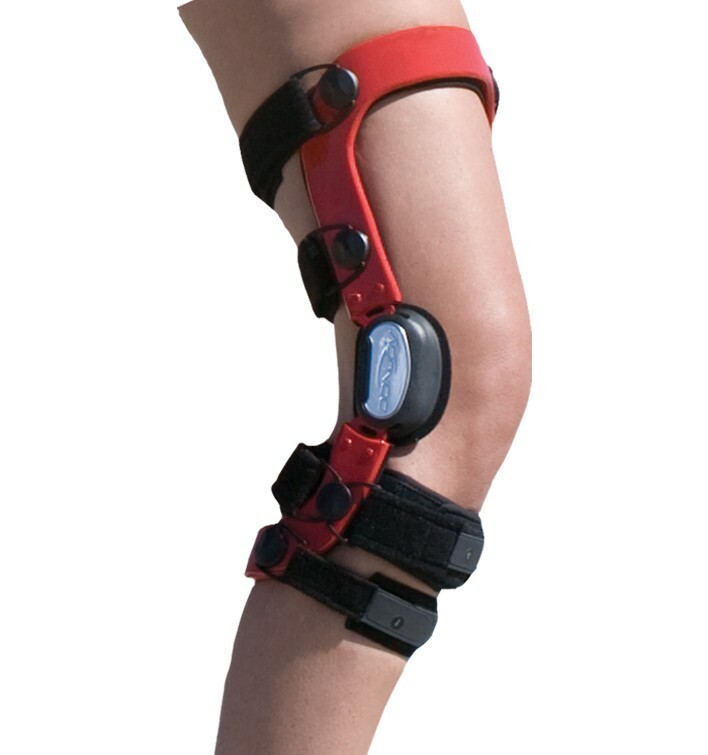 Would this brace help while playing football for protecting the knee? Yes, it is recommended for prophylactic knee ligament support, the ACL in particular. If you prefer to use a standard (non-custom) knee brace that protects and supports the knee ligaments, we recommend either of the following: the Legend, 4titude, Armor, or Full Force. How do you wear soccer shin guards with one of these knee braces? The brace comes in two different calf lengths. If you are concerned with shin guard clearance, I suggest ordering the "short calf" version. Is the defiance III suitable for playing basketball. I had an acl injury and a meniscus tear. Yes, the Defiance III is a great brace for basketball among many other sports and activities. I've used both the CTi and DJ Full Force knee brace. I like the way the DJ brace upper attachement grabs the top of the tibia and I find that it doesn't slide down as much as the CTI. However, during kitesurfing I want a brace that is very stiff laterally and I find the stiffness of the CTI to be superior to the Full Force though. How would the lateral support of the Defiance compare to a CTI and a Full Force brace? And would a short calf be less prone to migration as it would have both straps above the bulk of the calf muscle? How does the support and stiffness vary with the calf length option? The Defiance is made of carbon fiber and it the stiffest brace we have. We have an additional order option to reinforce the brace with another layer of carbon fiber if you want. The reinforced frame is an option we market to our collegiate and professional football players as well as other high contact or extreme sports athletes. The Defiance also has our 4-points-of-leverage system, which helps with fit and suspension. But, most importantly it help prevents anterior tibial translation, which can injure the ACL. Depending on you calf shape and size, the short calf may be helpful to prevent migration. The shorter calf length will not compromise the stiffness of the brace. Another option for an off the shelf brace is our Armor. It is made of aircraft grade aluminum and is our strongest off the shelf brace. Is the knee brace waterproof? It's ok to take in the water. Just make sure you rinse the hinges and softgoods out with fresh water, let it dry, and re-lubricate with a teflon dry lubricant. Usually a bicycle chain lubricant will work. How do you clean or wash the defiance III knee brace? Keep soft goods attached and hand wash with mild detergent and air dry. Some patients will just wear it in the shower or dunk it in a soapy water tub and a fresh water tub after each use. I have just had my 4th acl surgery. I am 16 years old and love sports and never see myself quitting. I have had 3 surgeries on my left knee including the one I had 6 weeks ago. My other knee braces don't help me because my left knee is very loose and my tibia slides to the inside very easily and a lot. Can your knee braces help to make that stop? The other surgery I had on my left knee made my knee do the same thing that I just explained and I did just as I was told in physical therapy and by my doctor who is ranked in the top 10 surgeons in Ohio. If the Donjoy knee brace can't help me then there is no other brace that can help me. I know this because I have tried on every brace imaginable. My sporting career is on the line. Can the Donjoy knee brace stop the movement of my tibia? The best Donjoy Knee Brace for your condition is the Custom Defiance ACL Brace with Fourcepoint Hinges. The frame design combined with the hinge to protect the ACL would be your best choice. In saying that, it is part of the equation. The surgery, therapy, your compliance in applying the brace properly and wearing it at all times is important. It sounds like you've had a long history of injuries so this is something you should discuss with your surgeon and family. However, to answer your question, this would be your best choice. Does this brace need to be worn underneath clothing? Or can it be worn over jeans or any other type of pants? It should be worn under clothing if possible. You will not be able to wear it under tight jeans, so wear it over the jeans in that case. Yes, you may use the Donjoy Defiance III in water. Uust rinse it with fresh water after each use and air dry. You may use dry Teflon lubricant to prevent hinge wear and tear such as Triflow or White Lightening. I have the townsend full shell knee brace. The problem is that the brace slides down when ever I run with it in football and it's too heavy. Would DonJoy Defiance III be better instead of the Townsend Full shell knee brace? The DonJoy Defiance III will fit better than any off the shelf brace due to the fact that the brace will be custom built for your leg contours. The Defiance weighs approx 20 ounces, while the Full Force weighs 22 ounces. The Defiance can be remade to new measurements within 4 months of the brace's manufacture date, after that it can be remade at a lower price. At this time we are a retail website only, with no physical retail location. Is a custom fit brace good for a 16 year old boy that is still growing? The DonJoy Defiance III Custom Knee Brace is ideal for a growing patient. First of all, you'll get a size change remake within 4 months, free of charge. Secondly when the patient does grow beyond the brace measurements, a remake will cost significantly less than ordering another off the shelf brace. No, you do not need a prescription to order the Defiance. You can place the order online and once it has been ordered, a DonJoy Sales Representative in your area will contact you to schedule an appointment to be measured for the brace. I have struggled with knee pain and weakness since I was run over by a potato combine about 40 years ago. It finally got to a point where I needed some help. I thought that I would need to have a knee replacement surgery but I was a little afraid because I have heard some good and some bad things about that type of surgery. I wear the brace every other day now and it is amazing how good my knee feels. I did not have the surgery, at least not yet, I will put it off as long as I can. However, using the brace I can run, walk, exercise and do just about anything I want to try to do. I have not felt that weakness in my knee since I started wearing the brace. If I find that my knee hurts for whatever reason I put on the brace and the pain is gone almost instantly. The day I got the brace my wife and I went for a 2 mile walk. It was so nice to be able to walk with my lovely wife in the open air and not have pain for several days afterward. The DonJoy brace has been such a blessing in my life. At first the pressure on inside of my knee was annoying but the pain relief far outweighed the annoyance. The inner sleeve is a great option, I used it all the time at first but I don't need to use it now. This is an awesome product thank you so much for your help. I am a gymnast and I tore my ACL and both meniscus on my left leg. 2 weeks after surgery i got the brace and it has been amazing! the support i got from the brace was incredible! the straps are a bit uncomfortable, but if you get the under-sleeve for it, it makes it alot more enjoyable to wear. Its been 7 months since the surgery, i am back to tumbling with the brace and i never think twice about doing a skill when i have the brace on. I love it!! tore my acl and have been wearing ever since. Provides great knee support and I have more confidence that my knee will not give out. Some discomfort from the straps and material touching the skin on the inside of the brace, but no other complaints. I need my knee replaced, but want to wait till summer because of the length of time off. This brace has made it possible for me to walk, and walk pain free allowing me to have the surgery when I can afford to take the time off. I didn't realize how much I was throwing my hip out until I walked with this brace on. End of story...I can walk again and I have no pain . At first this hurt the inflamed side of my knee that the extra pressure was on. But now in about a week I have no pain at all when I wear it. The DonJoy Defiance is so light that exercise is very easy and it doesn't through me off balance at all. My only complaint is where to find pants that can be worn over it with it sticking out. I finally bought a couple of skirts because this definitely doesn't work under jeans. 1. WOW! The pain is gone as soon as I put them on. When we decided to go to the braces, my doctor told me that many people don't wear them because of the bulk and visibility. "They aren't very effective when they sit on the shelf." I am not finding it difficult to wear them since the inconvenience PALES in comparison to the pain relief when wearing them." 2. What took me so long to agree to these? If only I knew then what I know now. I want to shout from the rooftop to all those people struggling with the decision to make the financial investment and to commit to the inconvenience. Count me in as a true believer! Alter the design such that the brace can be removed without removing shoes and pants. Can both the bottom and top be on the same side? I travel frequently, the braces set off the metal detectors at the airport. Can they be constructed of another material that won't do that?